Oldest course in the cotinent still in its original location... History, tradition, great green fee price, open on Mondays.... Some of the reasons why is a must, unless you are expecting somehting of outstanding maintennace. 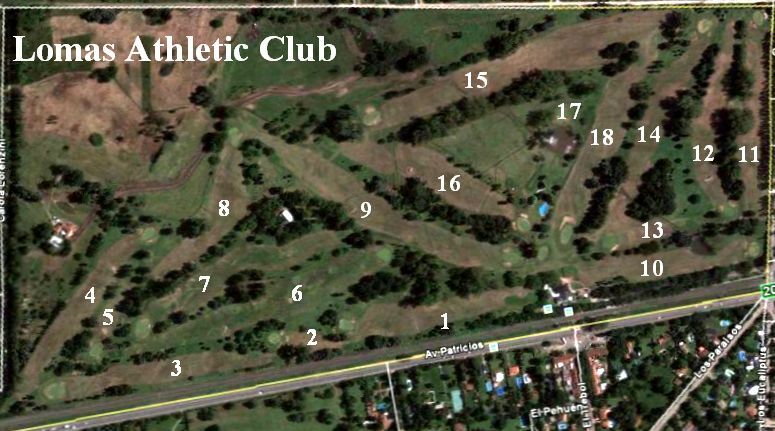 Lomas Athletic Club is the oldest course in South America, it is located in Tristan Suarez, in the Buenos Aires province. This club was settled by the english in 1891. It has old and beautifull trees, its greens are small and hard, and fairways are very tight making this course a real challenge for the visitors. It is a very traditional club, where the Argentinean Open has been played in many oportunities. This makes of Lomas a place where you can enjoy of the history of golf. This is a very tough 3-shots straight hole. Of course is impossible to get the green in two, but is really difficult to get the green even in 3 unless you are not a long hitter. If you drive around 230/250 yards, the landing area of the second shot is cross by a diagonal water channel that will putt your ball in risk. If you play shorter of that hazard, the you will have 180 yards to the pin. However if you make 450 yards with your first two shots, then you are safe.